In the 1920s, Wrexham operator Western Transport was running between Wrexham and Ruthin on market and fair days. At the end of that decade, this gradually expanded to a daily service, several times a day, though the timetable varied depending upon the day you travelled. 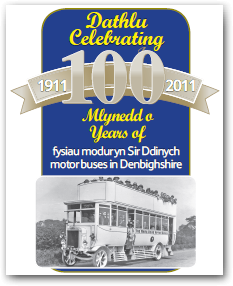 Crosville Motor Services took over Western Transport in 1930 and during Crosville's tenure, at is height, the Ruthin to Wrexham bus service operated up to six times a day. Crosville extended the service to Denbigh and this proved popular for those visiting friends and relatives in Denbigh's former North Wales Hospital. During the 1950s, Crosville regularly operated double decks on what became the D8. In the 1970s, the service was to see harsh times. There were cuts in service. The service was actually withdrawn for a period of about a year and a half, in 1984, before being taken over by a Wrexham firm called Dyma Fo, on two days a week only. In 1986, Wrexham operator The Wright Company acquired the service. By now, it was operating on Mondays and Saturdays only and numbers were so low it only needed a minibus. The service passed to GHA Coaches in 1992, again on two days only, again with minibuses. The service was augmented to include a Thursday run in 1998 plus Pat's Coaches began operating part of it. Soon after, M & H took over from both GHA and Pat's. M & H operated initially once a day in each direction on Mondays to Saturdays, then twice a day. M & H Coaches introduced low floor, accessible buses to the route. There were positive signs of passenger growth with buses full and sometimes with standing passengers. GHA took over the service in 2007. It operated six times a day between Denbigh, Ruthin and Wrexham and approximately hourly Ruthin & Denbigh to Rhyl. 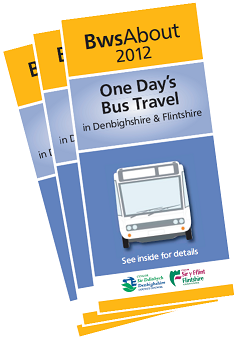 In was in May 2009 that in partnership with Denbighshire County Council GHA was able to invest in a fleet of five brand new, accessible single decks that converted the route to hourly during the day. Evening and Sunday services were introduced. Passengers have responded to the improvements and the service has seen 100% passenger growth in the first year. 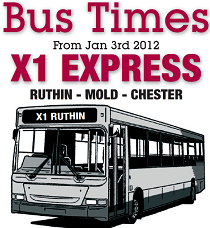 Recognising the X50/X52's success, the service won the Bus in the Countryside Award at the November 2010 UK Bus Awards.